Ken Ham (founder and president of Answers in Genesis, the Creation Museum, wannabe arc builder) is a Young Earth creationist, and he prides himself in taking everything in the Bible literally. AiG even says that they don’t interpret the Bible, they “just read it”, which is of course a load of hogwash, as everything is written interpreted in some way (for example from other languages to English!). I agree with him on two points, but then I think that’s it: that it makes no sense to pick and choose which parts of the Bible to take literally, and that he is entitled to his beliefs. How can we know which parts of the Bible are allegory and which stories really happened? I think we can’t. Ham’s and my solution are just completely opposite, as I choose to believe that everything in the Bible is written by man. And on the latter agreement, he can believe what he wants. I just wish he would keep it to himself, because I think his beliefs are really bad for society. I don’t object to his beliefs merely because I can. I don’t bash him and AiG just because I have a right to do so, but because they are demonstratively making things worse for us all. Creationism, global climate change denial, anti-science, anti-rationality, anti-education, etc. I write this because many people, Christians and atheists alike, are accomodationists. They believe there need not be a conflict between religion and science. They often point to prominent scientists who are/were religious (Francis Collins, Kenneth Miller, Isaac Newton, etc.). But that these people manage(d) to reconcile their faith with scientific facts doesn’t mean that it is a logically consistent position. They have merely succeeded in compartmentalizing these two spheres of knowledge so they don’t overlap. Really?! That’s one of the saddest passages in the Bible? How about the flood, when most humans and animals perished? What about when the LORD sent two bears to maul 42 kids? Here is the eternal dichotomy that is such a huge problem for Christianity, but which is always ignored: if God is omnipotent, why does he need our help? Why doesn’t he just make it so? If he gives us free will, how can he know everything? And why did he need to torture his own son in order to forgive us for our sins? Why doesn’t he just forgive us like normal people forgive each other without the barbary? So what is Ken Ham’s solution? In other words, shield your children from the evil ways of the secular humanists. Teach your kids apologetics. 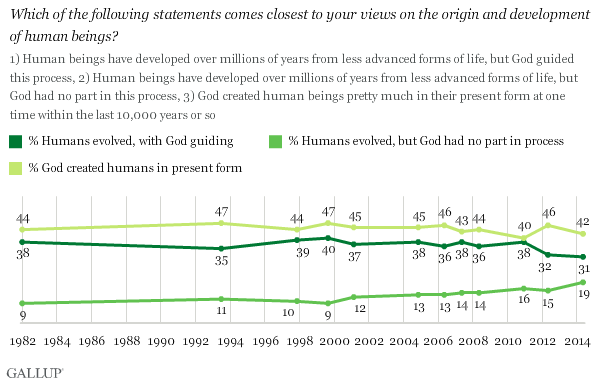 I am pleased to see that Ken Ham really has no new answer to his problem. I’ll give him one, though: remove the First Amendment, teach only the one true religion in public schools, shut down the internet, build a theocracy. That will really make your problem go away, because the next generations would then be ignorant of how the world actually works. Move to Saudi Arabia, Ken.